Who is AC Milan's Player of the Season? Whether you would prefer to file AC Milan’s 2013-14 campaign under disappointing or disastrous, there can be no escaping that this has not been one of the club’s more glorious seasons. Under Massimiliano Allegri, the Rossoneri struggled to make any headway in the league, while the slight improvement in Serie A under Clarence Seedorf was upset by disappointing cup exits to Udinese and, most notably, Atletico Madrid. But while a large emphasis has been placed on the need to gut a massively underachieving squad, there have been a few shining lights amongst the gloom during the past nine months. Below, in alphabetical order, are Goal’s three nominees for Milan’s player of the season, based on their club performances in all competitions. Cast your vote in the poll at the bottom of the article. He may have continued to court controversy over the course of the season, but Mario Balotelli has not failed to show the footballing talent that makes him such a magnetic figure. With 14 league goals he has netted twice as many times as any other Milan player, exemplifying his impact on the field for the Rossoneri. Even in a campaign during which he missed penalties for the first time in his career, he was always the side’s go-to man. He struck perhaps his greatest ever goal at a crucial time in a vital game early on in Seedorf’s reign, netting a blinding 30-yard effort in the final five minutes of an otherwise drab affair against Bologna, and would later score three times in the five-game winning run which sparked Milan’s late Europa League push. 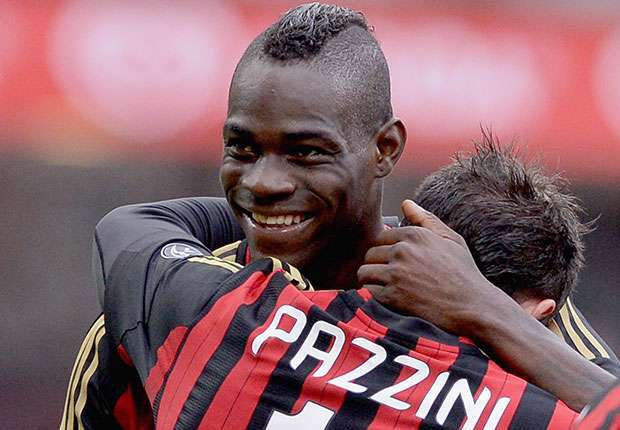 Balotelli may have become a byword for consternation, polarising opinion inside and outside of football, but there can be no doubting that he has been one of the key men in the Diavolo‘s rare positives of 2013-14. Rarely has there been a more fitting matchwinner than Nigel de Jong in the second Milan derby of the season. The Dutchman’s header marked his first goal of the campaign in an otherwise forgettable game, but the glory that came with it was reward for a superb first full season in the red and black. The 29-year-old has often found himself performing a thankless task in the centre of Milan’s midfield, lacking any great amount of support from those around him as the once-great club have struggled at length. But he has responded to that like a champion, often bailing his lesser team-mates out, whether it be with a crunching tackle after tracking an opponent’s run or spotting danger one step before everyone else to relieve the pressure on the Rossoneri’s buckling defence. De Jong has truly been a rock during 2013-14, responding to the various ups and downs at the club by sticking his chest out even further and carrying the weight of the team on his shoulders. He has by no means been the Kaka of 2003 to 2009, but the Brazilian’s return to San Siro has coincided with improved health and an increase in form after his hellish spell at Real Madrid. After making the classy decision to waive his salary during his early spell on the sidelines, the 32-year-old bounced back upon his return to action, scoring seven goals and had a hand in four more. His brace against Atalanta helped to take him past 100 goals over his two spells in red and black, and he would add another pair against Chievo as Milan closed on the top six spots. The No.22 has stated that he would like to remain at Milanello for another season despite having a clause allowing him to leave this summer, with his mini-renaissance over the past nine months reminding Milanisti of glorious times gone by.